When you get to me and the part where I'm to promise to 'love, honor and obey' and 'forsaking all others, be faithful to her forever,' I'd appreciate it if you'd just leave that part out." He passed the clergyman the cash and walked away satisfied. The wedding day arrives, and the bride and groom have moved to that part of the ceremony where the vows are exchanged. When it comes time for the groom's vows, the vicar looks the young man in the eye and says, "Will you promise to prostrate yourself before her, obey her every command and wish, serve her breakfast in bed every morning of your life and swear eternally before God and your lovely wife that you will not ever even look at another woman, as long as you both shall live?" Th e groom gulped and looked around, and said in a tiny voice, "Yes." The groom leaned toward the vicar and hissed, "I thought we had a deal." 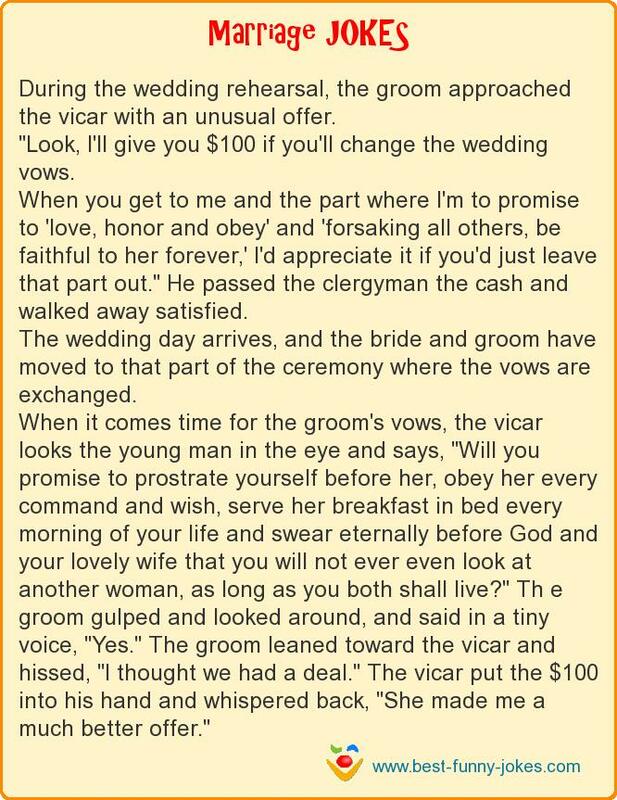 The vicar put the $100 into his hand and whispered back, "She made me a much better offer."